Many roads lead to Berlin Adlershof: Three buses, two streetcars and one train take researchers, developers and students each morning to Europe’s most state-of-the-art and innovative science and media hub. Members of SMZ’s staff, on the other hand, travel to work in a refreshing and remarkable way. Here’s a snapshot of their commute. Arriving at half-past eight, Stephan Müller-Ziebur is the first person at the SMZ office. By this time he has already travelled 10 miles on his bike. The next to arrive is Stephan Leuendorff, who cycles 15 miles from north Berlin and also jogs for an hour before work on sunny days. However, the German duathlon champion is not an exception at SMZ: developers Marcus Thormählen and H.C.L. Barz also ride their bikes into SMZ’s underground bicycle parking lot each morning. Marcus puts in nearly 11 miles on his bike commute and H.C.L. almost 9 miles. In the Center for IT and Media III showers are available so that everyone can freshen up before starting to work. 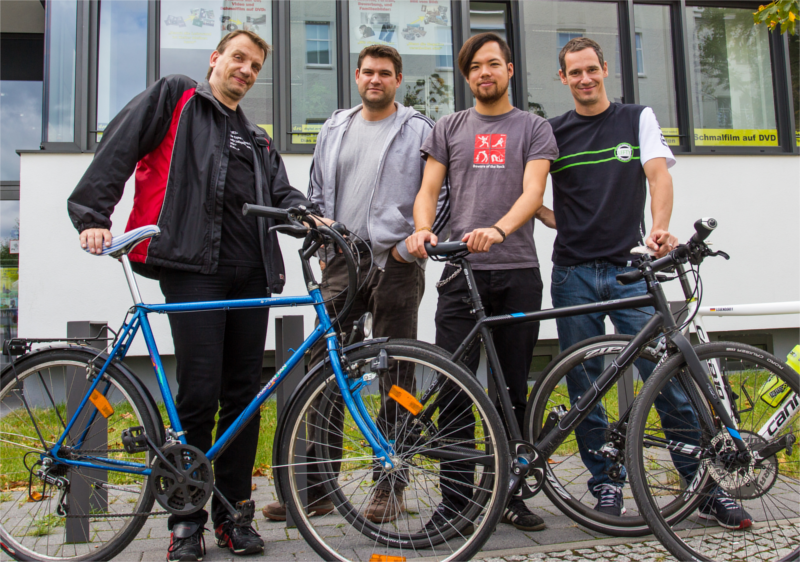 Altogether, the SMZ team covers some 90 miles on their bikes every work day. In a year, this amounts to more than one trip around the Earth’s equator.